Linn Linnaeus (2007) duet for violin and guitar Marian Budos John Couch, Judith Hickel 10 mins, 22 sec. The magic lute (2010) the minstrel's tale Marian Budos John Couch 9 mins, 12 sec. Recorded/performed at: Blue Bear Studios Richard Charlton John Couch 8 mins, 29 sec. Recorded/performed at: Blue Bear Studios Sally Greenaway John Couch 3 mins, 39 sec. Recorded/performed at: Blue Bear Studios Sally Greenaway John Couch 3 mins, 50 sec. 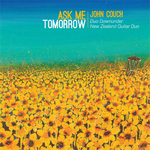 Also includes: Sonata 1 / Ross Campbell -- Ask me tomorrow / John Couch. Liner notes include program notes and biographical information about the performers. Score: The magic lute : the minstrel's tale, for classical guitar / Marian Budos. Score: Night rain in a tropical garden : for violin and guitar / R. Charlton. Score: Linn Linnaeus : duet for violin and guitar / Marian Budos. Parts: Linn Linnaeus : duet for violin and guitar / Marian Budos. Score: De la luz : for guitar / Sally Greenaway.